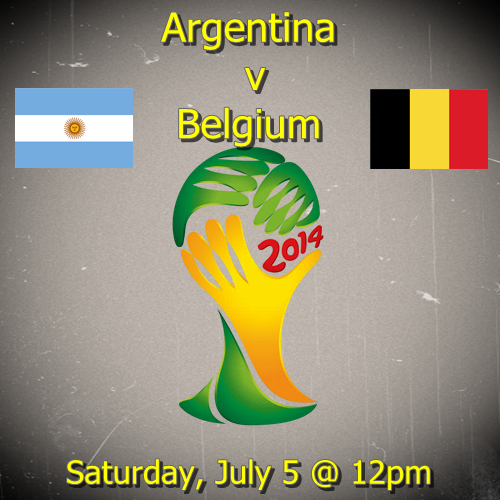 This Saturday, July 5 features the final two of the four quarterfinal matches for the 2014 World Cup and starts with the 12:00 noon game between Argentina vs Belgium. Once again, there are two group winners who required extra time to make it through to the quarterfinals. Both Argentina and Belgium won their groups with three wins, nine points and a +3 goal difference, and yet, there are question marks for both teams. Argentina has some of the best attacking players in the world including Lionel Messi, and yet, they were unable to break down a Swiss defense that France had previously scored 5 goals on, until the 118th minute. Time and time again they have had to rely on Messi to carry them, but even he has not been able to truly step up and pull them through convincingly, despite a few moments of brilliance. Belgium has become a team that leaves it late in every single match. Their earliest goal was the 70th minute winner over Algeria in their very first game. Against the United States they had to wait until the 93rd minute in extra time to score their first goal before going on to win 2-1. While they haven’t been convincing, they have been consistent. Often times the sign of a good team is that they still manage to win, even when they play poorly. While most of the teams that have made to the quarterfinals fit this description, Belgium seems to have taken it to heart. This is a team that is filled with outstanding individual talent all across the pitch, yet they seem to struggle to play coherently for most of the match, but somehow they manage to find that one or two moments of brilliance to seal a win. My prediction is an Argentina win in extra time. With that said, I am not completely sold on this Argentina team. Their back line has been shaky and the speed of this Belgium side could certainly get at them, cause mistakes and create goals. Belgium did force 16 saves from Tim Howard in the 120 minutes against the U.S. and Romero is not as good a keeper as Howard is. Belgium’s defense is very solid, especially with Vincent Kompany, but Jan Vertonghen playing at left back is a weakness, especially considering that he does not like playing there. This is an area that could be exploited, especially by the likes of Lavezzi or even Messi. Belgium will likely start with Origi up front and look to bring Lukaku on late to bully Argentina’s defense after they have been softened up. They will also likely start Dembele in central midfield to work on breaking up play and shutting down Lionel Messi.